Faith has a salami blossom (because the salami slices are smaller than average, I actually used three pieces, one after the other, to make the blossom look fluffier). To go with said salami blossom, she has muenster cheese flowers, woven wheat crackers (aka Target brand Triscuits), a few carrot sticks, cantaloupe and blackberries. I just love the blossoms, I need to do this more often. And in other news, if you get Family Fun magazine in the mail, check out p. 51 of the February issue to see F&B! It's all from this post, but it's so cool seeing their pictures in a big magazine! Baby Einstein Discovery Kits Review & Giveaway - Come enter! 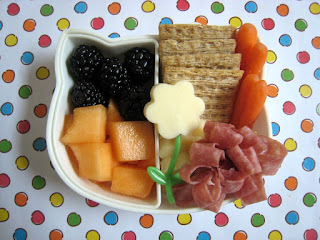 That's a perfect snack bento...even for me! Congrats on getting F&B in the magazine! I had subscription of that for a long time...just recently discontinued due to budget. I love the different ideas the magazine provides! Shannon, I was reading my Family Fun magazine...is that your children and your muffin tins on page 51?! CONGRATULATIONS!! How cool are YOU?! I just saw Faith and Ben in Family Fun!! If you blogged about it, I must have missed it :) VERY fun!! Enjoyed the muffin idea and seeing your kiddos in Family Fun! Also like seeing the Dallas area represented! Wow! That was you?!! I just stumbled across your blog this week, but wanted to say how memorable your Family Fun idea was. After reading the magazine, we immediately tried out the make your own muffin idea with our playgroup and all of the kids loved it! Thank you for such a clever idea and such a fantastic blog!